‘Without doubt Judy was the worst of the seven, probably because she was the cleverest.’ Her father, Captain Woolcot, found his vivacious, cheeky daughter impossible – but seven children were really too much for him and most of the time they ran wild at their rambling riverside home, Misrule. 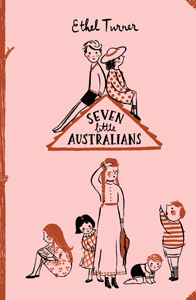 Seven little Australians was published before literature awards were given in Australia. The first edition sold out in weeks and was immediately reprinted. The novel has been continuously in print for over 100 years: it has sold over 2 million copies in the English language, has been reprinted over 50 times, translated into at least 11 languages, performed as a stage play, and made into a film, a BBC television series in 1953, and a 10-episode television series for the ABC in 1973. The book is now regarded as a children’s literature and Australian classic. One of the NSW Premier’s Literary Awards is named the Ethel Turner Prize and is awarded for a work of fiction, non-fiction or poetry written for young people of secondary school level. The recipient currently receives a $30,000 prize. Seven little Australians was published in London in 1894 for both English and Australian audiences and was an instant success. From its opening lines the novel constructs a strong sense of Australian identity as Anglo-Celtic and middle-class, with the seven children portrayed as distinctively Australian, rather than as transplants from a British public school, which was more typical of such literature at the time. The novel overturned the Victorian literary conventions that romanticised family life, sentimentalised death and presented ‘good’ characters as models for readers to follow. Saxby suggests that Turner’s writing was ‘representative of the shift [in content and formal tone] that was taking place in our children’s literature [at that time]’ (Saxby p. 7). While there are connections with the domesticity depicted in the earlier Little Women (1868–1869) (with Ethel Turner regarded as Louisa May Alcott’s successor), the Woolcot’s suburban family life is not idealised. The father, Captain Woolcot, represents the ‘old world’ in his self-preoccupation and rigid view of how family life should be lived, with his children preferably not seen nor heard and a strict discipline imposed for any transgressions. His energetic children, on the other hand, each display a distinctive and often rebellious independence, which reverberated with the political and patriotic thinking in the 1890s, as the colonies moved towards the ‘new world’ of Federation. Turner also resists, to some extent, the sentimental death scene, usually portrayed with acceptance and piety, such as Beth’s resignation to her death in Little Women. When a tree fatally falls on Judy as she saves her baby brother, her siblings do try to calm her with prayers and soothing words but Judy refuses to accept her death and loudly protests it as long as she can. Overall these children are not models of good behaviour, but characters whose thoughts and actions are very believable and who create humour for readers, rather than preach to them. They are, perhaps, Turner’s response to the interests of a new extended readership due to the increase in literacy brought about by compulsory schooling, introduced the 1870s. The Bulletin in Sydney, where Turner was employed, promoted a view of Australia as a vital young country – the paper advocated republicanism and was a major agent in constructing the mythology of the Australian bush landscape and the resourceful men who lived and worked there. Misrule, the Woolcot’s house at Parramatta, imitates rural life with its wilderness, stables and paddocks sloping down to the river. The reality of pastoral life occurs at Yarrahappini, the prosperous cattle station owned by Esther’s father, Mr Hassell. This is a peaceful and productive place where the men are tough and capable. These ideas of place and bushmen are depicted in Banjo Paterson‘s bush ballads, such as The Man from Snowy River and the lyrics for what became Waltzing Matilda, both published in 1895. Many paintings of the time, for example, Tom Roberts‘ vision of male strength and labour in The Golden Fleece (1894) and Sydney Long‘s serene By Tranquil Waters (1894), reiterate these visions of the Australian bush and the men who worked there. Henry Lawson, on the other hand, disagreed with Paterson’s positive images and wrote of the hardships of the bush, such as in While the Billy Boils (1896). This view of the isolated life is glimpsed in the characters of the alcoholic bookkeeper, the laconic boundary rider, and in the great distances from medical or neighbourly help when Judy is fatally injured. The novel is typical of literature at the time in its suppression of Indigenous Australian history. Tettawonga is one of the few Aboriginal stockmen at Yarrahappini: he is depicted as both a capable stockman and an idler around the homestead, where he permanently lives on its fringe as a reward for bravely saving Esther and her mother from bushrangers; he is amused at Pip’s attempts to be a bushman; and he is kindly and thoughtful at Judy’s deathbed. Clare Bradford suggests that he ‘serves to bestow legitimacy on the squattocracy’ and ‘conforms to the colonial trope of the loyal black servant who demonstrates the benevolence of his masters’ (Bradford p. 288). Further, a four-page episode, where Mr Gillet makes positive comments about Tettawonga’s ancestors and retells an Aboriginal story, was removed from all editions after 1897 and not restored until the centenary 1994 edition. This ‘lost’ section removed any mention of an Indigenous history in this anticipated ‘new’ world of Federation. The discourse of silence is one realisation of the relations between colonial and Indigenous Australia in the 1890s. Bradford, C. “Australian children’s literature.” The Cambridge History of Australian Literature. Ed. Peter Pierce. Cambridge University Press, 2009: 282-302. Saxby, M. “Challenging the young reader? Changing perspectives in Australian children’s literature”. Bookbird 37.1 (1999): 6-12. The total population of the colonies was around 3 million Europeans. The total population of Aboriginal and Torres Strait Islander Peoples was estimated around 93,000 in 1900, a decrease of almost 87% from 700,000 in 1788. South Australian women were granted the right to vote. Legislation for the ‘protection’ of Indigenous peoples had been established in the different colony states, and every aspect of Indigenous life was controlled. Protection Boards were empowered to remove children from their families. The Stolen Generations legislation was not repealed until 1969. Colonies were recovering after the major Depression of 1890–1893. The first industrial and arbitration legislation was passed in South Australia, as a means of preventing and settling industrial disputes. Ongoing industrial unrest, and a second shearers’ strike led to the formation of the Australian Workers Union, a forerunner of the Australian Labor Party. Lawrence Hargrave achieved the first powered flight, with an engine attached to four box kites. The first screening of a film took place in Pitt St, Sydney. An invention called the bicycle became more popular. In NSW, 670 bicycles were imported in 1894; six years later in 1900 there were about 30,000 bicycles in NSW. In the 1890s, for the first time, the majority of Australians were Australian-born: children of the gold rush immigrants. A number of well-known Australians were born around this time: HV Evatt (politician), Robert Menzies (Prime Minister), Charles Kingsford Smith (aviator). Queen Victoria was on the British throne. New Zealand enacted the first minimum wage law. Marie Curie studied at the Sorbonne. Coca-Cola was sold in bottles for the first time. The International Olympic Committee was founded in Paris and decided to hold the modern Olympics every four years. The petrol-driven auto was patented by Karl Benz of Germany. Nicholas II became the new, and last, Tsar of Russia after his father, Alexander III, died. Many writers, musicians and actors, whose fame continues today, were born, such as e.e. cummings (American poet), Jean Renoir (French film director), Aldous Huxley (English author of Brave new world), Jack Benny (American actor), King Edward VIII, afterwards the Duke of Windsor (UK). Ethel Turner (1873–1958) came to Australia with her mother and sisters when she was 10 years old. She showed a great love of literature while at school and in her late teens launched a literary and social magazine in Sydney with her sister Lilian. Ethel kept diaries for a remarkable 62 years, recording the details of her full and eventful life. In January 1893 she recorded in her diary, ‘Night started a new story that I shall call Seven Little Australians’. Later that year, she finished the book, parcelled it up and sent it off to a publisher in Melbourne. Since then the book has sold over 2 million copies in the English language and has been reprinted over 50 times. It has been translated into at least 11 languages, performed as a stage play, and been made into a film, a BBC television series in 1953, and a 10–episode television series for the ABC in 1973. Ethel Turner went on to write over 40 books in her lifetime, including children’s stories, short stories and poems, many of which appeared in the Town and Country journal and in the Sun Herald newspaper. Seven Little Australians has been read and loved by children all over the world, and it has been continuously in print for over 100 years. Ethel Turner died in 1958, leaving as her memorial a book that is now regarded as a classic in children’s literature. Her granddaughter Philippa Poole has published a book about her grandmother entitled The Diaries of Ethel Turner.